From age 4-15, active children and adolescents are vulnerable to disruption of the posterior calcaneus, a growth plate in the back of the heel, through direct impact or chronic micro-trauma—many times in organized athletics. While a great deal of sports literature is devoted to the adult athlete, many of us with active lifestyles have equally active kids. My daughter is very involved with soccer, and many of her teammates continue throughout the year in other sports such as cross-country, track, volleyball, basketball, etc. 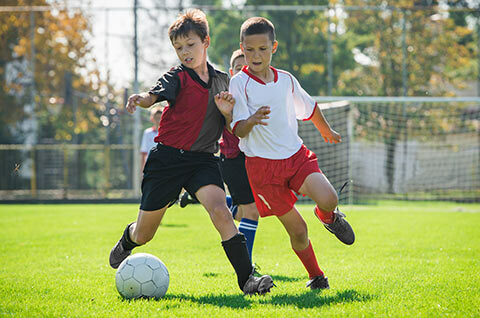 While there is crossover between kids and adults—similar injuries accompany similar activities—kids have a unique anatomy in the lower extremity that predisposes them to different vulnerabilities. They are also growing in size, which is placing greater weight upon their frame as they develop skills and coordination while challenging themselves to perform at a higher level of intensity. With this article, I’d like to introduce a common heel injury that specifically affects children and adolescents and is most often accompanied by collateral injury more common in adults. The boney skeleton develops from a cartilage template by endochondral ossification, (the process by which the cartilaginous skeleton transforms to bone.) Keeping in mind that cartilage can’t be seen on x-rays, some of this new skeleton can be seen and some can’t, with many of the joints imperceivable radiographically until later years. The ends of many bones develop secondary ossification centers called epiphyseal plates, which complete the process of turning cartilage into bone by the second decade of life. On the left is an x-ray of a 12 month-old’s foot. On the right is a radiographic image at 12 years of age. Notice the difference of the shape of the bones as well the new growth plate in the back of the heel (posterior calcaneus), which appears between ages 4-7 in girls and 7-10 in boys. Left: x-ray of a 12 month-old’s foot. Right: radiographic image at 12 years of age. Notice the difference of the shape of the bones as well the new growth plate in the back of the heel (posterior calcaneus), which appears between ages 4-7 in girls and 7-10 in boys. The full integration/fusion of this growth plate varies per individual, but will usually disappear from x-ray images between ages 12-15 as the calcaneus completes its reformation into maturity. During this window of development, from age 4-15, active children and adolescents become vulnerable to the disruption of this growth plate through direct impact or chronic micro-trauma—many times in organized athletics. Sever’s Osteochondrosis is a common ischemic injury to the growth plate at the insertion of the Achilles tendon, (the largest tendon of the lower extremity). In one 2014 study, the incidence was reported as roughly four in 1,000 of the general young population. Another study found Sever’s accounting for 2 percent of football injuries within a population ages 9-19, with peak incidence being boys under 11 years old. It can occur due to direct impact or chronic micro-trauma from every day vigorous activity. Left untreated, the blood flow will continue to be compromised to this growth plate resulting in chronic pain, a long-term change in activity, and upon rare occasion, even potential fracture of the growth plate itself. Once the growth plate closes, the symptoms can resolve. However, surrounding injuries such as Achilles tendonitis, plantar fasciitis, or tarsal tunnel may persist until treated. Sever’s Osteochondrosis: Deep pain within the heel as a result of the disruption of blood flow to the growth plate. Plantar Fasciitis: Pain on the bottom of the heel at the insertion of the plantar fascial ligament (usually) to the plantar medial tubercle of the calcaneus. This is usually a biomechanically related injury which could be triggered following a growth spurt. As your child’s size and weight increase, the normal activity is creating more of a strain on the lower extremities/feet. Tarsal tunnel: Entrapment of the nerve branches that exit the tarsal canal on the medial foot. This commonly accompanies plantar fasciitis and is usually associated with increased hyperpronation—which can also follow increased size as described with plantar fasciitis. Tibialis Posterior tendonitis: Pain in the medial shin just above the ankle which can extend down to the foot. This muscle/tendon’s job is to invert the foot and is opposed by a muscle/tendon on the lateral leg, whose job is to evert the foot. Together, these muscles allow you to conform to any uneven surface and work to allow normal biomechanical function during kinetic activity. With overuse, a rapid gain in size or tight Achilles tendon, the foot will usually favor hyperpronation during walking/running and elicit pain in the medial leg or ankle. Achilles tendonitis: Pain in the back of the leg within the tendon or calf muscle. Remarkably, there is no activity in daily living that stretches the Achilles area, and as it becomes tight with normal use can create pain not only in the back of the leg, but also in the forefoot. This is a significant contributor to abnormal load on a child’s growth plate and most always has to be addressed to facilitate recovery and return to full activity. Prevention is always preferable to treatment after an injury. If your child is involved in sporting activities, adequate rest is important both in the evenings by getting plenty of sleep and between sporting seasons. This is particularly important if your child moves from one sport to the next without much of an off-season. Also, developing good habits of stretching before and after physical activity is important even at this young age. 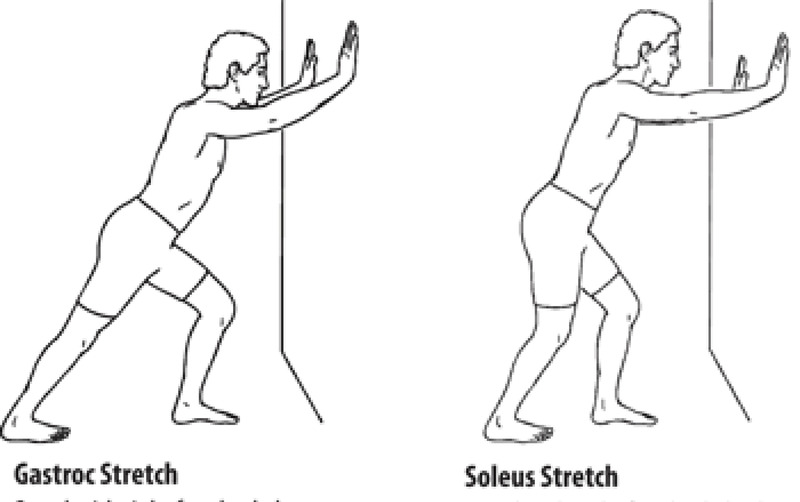 While many coaches assign stretching exercises, the most advantageous is the runner’s stretch as demonstrated. Questions to ask: If your child complains of pain with activity, here are some questions that may help discern the nature of the situation. If any of the answers give you pause for concern, you should have the situation checked out by your physician. Quick evaluation by your doctor may expedite recovery while avoiding further injury to a compromised area. An ache, like a deep bruise? Sharp pain like a needle? Burning? Numb or tingling, like your foot fell asleep? How long has it felt this way? Did it happen all of a sudden, or did the pain sort of sneak-up on you? What makes if feel better? What makes it feel worse? A thorough history and physical is always the first step. Given the commonality of growth-plate disruption at these ages, it ranks highly in the differential diagnosis. However, further assessment for collateral injuries is very important for resolution and return to normal activity. Also keep in mind that we don’t inherent such maladies genetically, but we do inherit the biomechanics that predispose us to similar function. Said more simply, we inherit our tire alignment and can many times expect similar tread wear. A thorough family history should be considered, if that information is available. X-rays can’t always see full details of an immature skeleton, but it can reveal a great deal. Any new growth plate can be seen and evaluated. Also, other details can be seen such as an abnormal bone growths, specific areas of soft tissue inflammation, abnormalities within the Achilles tendon or even a foreign body can be seen. The mainstay of treatment is rest. Four weeks of minimal activity, including a respite from sports, gym class, and vigorous play. Gel heel inserts in the patient’s shoes have proven to not only relieve pain but facilitate recovery. With collateral injury or biomechanical dysfunction however, custom orthotics may be beneficial for recovery as well as improving athletic performance in the future. Physical therapy may be necessary to gain flexibility in the Achilles tendon or to relieve edema or scar tissue. All said, each of these injuries may be treated with a high expectation of returning to normal activity. Early intervention and willingness to rest is paramount in recovery. As school sports are soon returning, I would wish you and your kids a safe and productive new school year! 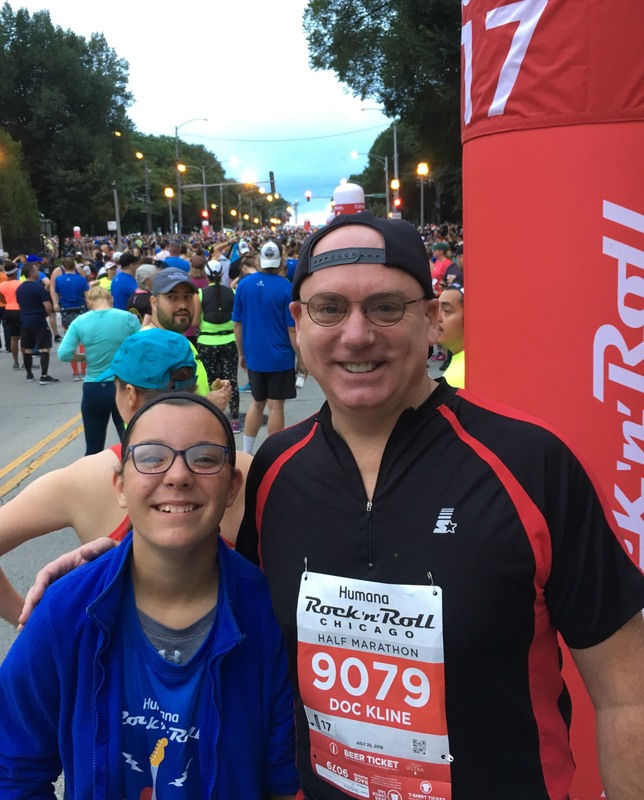 Congratulations to RPM contributor Dr. Randall Kline, cheered on by his daughter as he completed the Chicago Rock ‘n’ Roll 10K on July 22. Thanks for keeping RPM readers on their feet too!